The government has announced funding for small modular reactors. The Financial Times reports that UK ministers will this week renew their support for nuclear power with measures to strengthen the industry’s supply chain and develop a new generation of small-scale reactors. The newspaper says the action will signal the government’s continued support with a package of measures to increase spending on nuclear research. The announcement will also reportedly include long-awaited details of how the government plans to promote development of “mini nuclear plants” known as small modular reactors. Separately, there has been a breakthrough in plans for a new full size nuclear plant at Moorside in Cumbria. KEPCO, the South Korean utility, is said to be developing a deal to invest in the NuGen consortium, owned by Toshiba, which is the current owner of Cumbrian project. Due to its financial troubles and the bankruptcy of its nuclear business unit Westinghouse in the U.S., Toshiba has been trying to sell the project to a new developer. It appears that KEPCO’s interests is the answer to Toshiba’s prayers. The project was originally scoped as supporting three Westinghouse 1150 MW AP1000 LWR PWR type reactors. It isn’t known at this time if KEPCO is interested in building these units or its own 1400 MW LWR PWR similar to the four it is building for the UAE. Last June KEPCO said it would only invest in the Moorside project if it could build its own reactors. If this course of action is chosen, the design would have to complete the UK Generic Design Assessment which can take four-to-five years. The Westinghouse units cleared the GDA last March. After a long delay the UK government is finally ready to push funding out the door to kick start the development of an industry to produce small modular reactors in the UK. The Guardian newspaper reports that government ministers are expected to back the first generation of small nuclear power stations in Britain with £100 million this week, in an attempt to give the UK a competitive edge on the technology and provide a new source of clean power. Rolls-Royce as well as US and Chinese companies have been lobbying for the support since George Osborne first promised them a share of £250m two years ago. The Guardian reports that the energy minister, Richard Harrington, is expected to make an announcement this week. U.S developer NuScale has opened an office in the UK specifically to get business there as the SMR industry develops. Like many SMR designs that depend on LWR technology concepts, the entire assembly is underground, passively safe, and incorporates the steam generator within the reactor pressure vessel. Several sources told the Guardian that the industry had been angered by government vacillation on whether to throw its weight behind the technology. “They have blown a bit hot and cold on SMRs. There’s a sense that if we’re going to be part of this, we need to get on with it quite quickly,” said one. Another source said: “The way this has dragged on has hacked off the better ones [SMR developers].” They added that while the funding was welcome, it was expected to be a relatively small sum and they were unsure it would be enough to make a difference. Also, the newspaper noted that t is not yet clear who will win a share of public funds, or how the pot will be carved up between the 33 participants in the SMR competition. Government officials have repeatedly made it clear that developers will only get financial help if they can prove their SMR will be affordable and competitive with rival energy sources. The earliest an SMR is thought likely to be ready for deployment in the UK is around 2030. The Jordan Atomic Energy Commission (JAEC) and the U.S X Energy, LLC (X-energy) signed a Memorandum of Understanding (MOU) to assess X-energy’s advanced nuclear reactor – the Xe-100 – and its potential for deployment in Jordan. The reactor is a high temperature gas cooled unit based on the “pebble bed” design pursued by South Africa and other nations. Several veterans of the PBMR effort now work on the X-Energy project. If built the reactor would address a significant problem for nuclear energy in Jordan, which is scarcity of water for cooling systems. The X_Energy unit is cooled by gaseous helium. Chairman JAEC Dr. Khaled Toukan said in a press statement that “the HTR’s potential once implemented, will provide Jordan with opportunities that include both electric generation and non-electric utilizations such as water desalination and industrial applications. “This reactor is the nexus between 3rd and 4th generation technologies.” he added. Vice-Chairman of the JAEC Kamal Araj said the MoU comes within studies carried out by the Commission on a number of small nuclear reactors to select the best for Jordan. 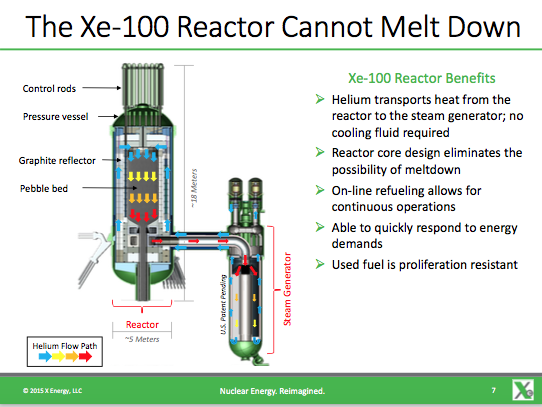 “Such a reactor does not need large amounts of water for cooling as it is cooled by gas,” he noted. World Nuclear News reported that last January, X-energy was awarded cost-shared funding of $53 million over five years from the DoE to support the development of the Xe-100, working in partnership with BWX Technology, Oregon State University, Teledyne-Brown Engineering, SGL Group, Idaho National Laboratory and ORNL. WNN also noted that in September 2017, Greenbelt, Maryland-based X-energy signed an MoU with uranium enrichment company Centrus. Under the MoU, the two parties will work towards the development of a fabrication facility to provide Triso fuel for the Xe-100 reactor. The companies will jointly prepare a deployment plan for the fuel technology; design a cost-effective, highly automated manufacturing process line; and seek funding for a future commercial fuel production facility. Jordan is also conducting a feasibility study to establish of two Small Modular Reactors (SMRs) based on light water dsesigns in Jordan for the production of electricity and water desalination, Vice Chairman of Jordan Atomic Energy Commission (JAEC), Kamal Araj in revealed on 11/14/17. Araj signed a memorandum of understanding with the British Rolls- Royce company to conduct a joint feasibility study to build a reactor designed by led by the company. The JAEC commissioner said that building the SMRs comes in partnership with the King Abdullah City for Atomic and Renewable Energy (KACARE) and the Korea Atomic Energy Research Institute (KAERI). 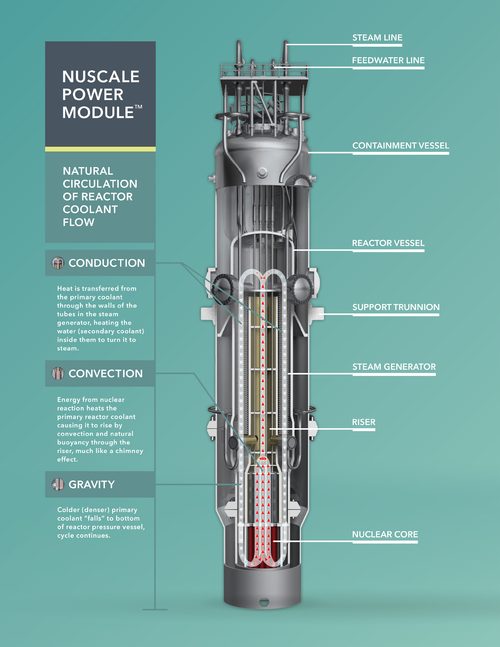 (WNN) A small modular reactor (SMR) could be in operation in Australia by 2030, according to Sydney-based SMR Nuclear Technology Pty Ltd (SMR-NT). The country would be imprudent not to factor SMRs into its energy security plan, the company has told the body established by the Council of Australian Governments (COAG) to implement energy security reforms. SMR-NT has set a timeline for development which would require a site to be identified within three years, and is looking for volunteer communities to host it. Building nuclear power stations in Australia would require changes to state and federal laws and overcoming deep community objections, and SMR-NT director Robert Pritchard said the company had adopted an “aggressive” approach to SMR-based nuclear development in Australia. The Energy Security Board was established in August by the COAG Energy Council to coordinate implementation of the reform blueprint for Australia’s electricity market produced by Chief Scientist Alan Finkel earlier this year. The board also provides whole-of-system oversight for Australian energy security and reliability. (NucNet): First concrete was poured today for the nuclear island basemat of Unit 1 at the planned Rooppur nuclear power station in Bangladesh, Russian state-owned nuclear corporation Rosatom said in a statement. In October 2013, Russia signed an agreement with Bangladesh for design work on Rooppur, on the banks of the Ganges river about 160 km from the Bangladeshi capital Dhaka. In 2014, Rosatom said the Rooppur units – the first nuclear power reactors in Bangladesh – would both be 1,200-MW V-392M pressurized water reactors. According to Rosatom, the first unit at Rooppur is scheduled to begin commercial operation in 2023 with the second unit following in 2024. In July 2017, Russia agreed to release a state loan to finance the construction of the bulk of the Rooppur project. No mention was made of the amount of the loan, but earlier media reports put it at $12.6bn (€10.6bn). (WNN) GE Steam Power Systems has announced the signing of a contract to deliver the main equipment of the conventional island for the Akkuyu nuclear power plant in Turkey. The contract has been awarded to AAEM Turbine technology LLC, the Saint Petersburg, Russia-headquartered joint venture between Atomenergomash JSC (AEM) and General Electric (GE). GE Steam Power Systems will supply the four nuclear turbine generator sets. The first Akkuyu unit, a 1200 MW VVER, is scheduled to be commissioned in 2023, while each of the remaining units are expected to become operational every year by the end of 2026. The plant will be owned and operated by Akkuyu Nuclear AS, a joint venture led by Rusatom Energy International.